Situated Overlooking the Beautiful Atlantic Ocean and Pristine Beach. Golf, Tennis, Beach. Bike Riding, Fishing, Friendly Atmosphere and Happy People. What More Could You Ask For? This quiet, peaceful resort is located in Ft. Pierce on South Hutchinson Island about 65 minutes north of West Palm Beach Airport, 2 hours to Disneyworld, 1/2 hour north of Stuart, 15 minutes from Jensen Beach and 1/2 hour south of Vero Beach. We are located 2 miles south of the northern tip of South Hutchinson Island. 25 yards from the beach, 3rd floor on a three-story condo with elevator. Totally remodeled with a bright cottage feeling. All new appliances. Master bedroom has a king size bed, full size sleeper sofa in living room, guest bedroom has two twin beds, Sleeps 6 total. Sliders in both bedrooms with screens. Porch with slider over looking Atlantic Ocean...Full size washer & dryer. BR B Amenities: /B BR Ceiling fans located in living room, master bedroom, guest bedroom, porch, and kitchen. Kitchen fully equipped with dishwasher, microwave, toaster, coffee maker, refrigerator with ice-maker. Linens and towels. Washer and Dryer, central air, 3 color TVs with Cable, , games, videos, puzzles, basket ball court, beach chairs, beach towels. Also featured next to the pool is a pool-side Tiki Bar which is open for food and drinks about 4 or 5 days a week depending on the weather, a 'kiddie pool' for small children, a hot tub, a Bocce court, and an exercise room with sauna and shower facilities. 65 golf courses within a one hour drive. executive 9 hole par 27 golf course. Deep sea fishing and party boats available from Ft. Pierce marina, surf fishing only yards away available for Blue Fish, Pompano, and many other species. South Jetty and Indian River offer excellent fishing. Bass fishing at Lake Okeechobee rated one of the best Bass Lakes in USA, only 40 minutes away. Ocean Village is within a half hour drive of the NY Mets (St. Lucie West) Spring Training Camp. Disney world/Universal Studios - 2 hour drive. Kennedy Space Center 1 hour & 45 minutes north. Harbor Branch Oceanographic Institute - 10 minutes north on RT 1. Gilbert Bar House of Refuge-Life Saving Station - 30 minutes south. UDT Navy Seal Museum - 10 minutes north on N. Hutchinson Island. Bathtub Beach Snorkeling And Swimming - 25 minutes south. Moroso Motorsports Park Year Round Racing and Heathcoat Botanical Gardens - 20 minutes. Lion Country Safari - 30 minutes. Land of Butterflies - 20 minutes. Elliott Museum - 20 minutes south. Biking available in complex and along RT AIA. Manatee Observation Area - 5 minutes. The Indian River Mall On RT 60 in Vero Beach. The Treasure Coast Square on RT US1 in Jensen Beach. The Prime Outlet Mall at the Vero Beach Exit off I-95 and RT 60. There are five community pools, three TV's in the condo and puzzles for children. So close you can hear the waves! Had an awesome stay in Ft. Pierce. Super accommodations and so many activities. Great communication with Bill and Marilyn. This property was very nice and quiet. Great view of the ocean. The condo was very clean and comfortable with a well appointed kitchen. Location was convenient to some great seafood restaurants. The owner was very attentive and gave us a good explanation of everything about the property. Thanks Bill! Well equiped, clean and comfortable 3rd floor condo - AC kept us cool during very hot summer weather. Elevator just across from condo's front door was great for hauling luggage and groceries as well as any mobility issues. Screened balcony with ceiling fan would be great in cooler weather, but you don't need to sit outside to see the ocean & dunes--fantastic view from the time you walk in the front door. Very short walk to lovely swimming pool and social center with library. Owners were very responsive to questions and easy to contact. Resort very quiet while we were there off season - between the condo and the complex amenities you have everything you need for a relaxing vacation...Don't miss McKee gardens in Vero Beach for great tropical Florida experience. We stayed in this very clean and comfortable condo for a week in August. It was our second time staying in Ocean Village. The condo’s view of the ocean is exceptional. 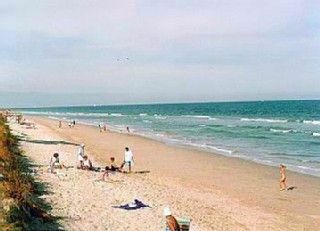 The beach access point only takes a couple of minutes to walk to from the condo. There is a shower and hose to clean off the sand next to the beach access point. The gated community is a short drive from restaurants and shops to the north in Fort Pierce. The owners were responsive to our reservation, and made sure everything was ready for our arrival. The rental condo was well equipped for our stay. There were plenty of dishes, cookware, towels, etc. There were beach chairs available as well. We would definitely stay here again. Great location with wonderful view. Great owners, easy to deal with. I will stay here again, it was perfect for our needs. We had a wonderful time at this Condo and the owner was in contact and stopped by to ensure all of our needs were met. We will be visiting yearly and will definitely stay in this property again.